Recently, I met the wonderful and talented Zoya, a singer-songwriter in her senior year at Berklee College of Music. After hearing the North Indian sounds in her music, along with her entrancing vocal style and lyrics, I knew I had to spread her music and story to other music lovers. Influenced by the likes of Camille, Susheela Raman, Fiona Apple, Ani DiFranco, and Sara Tavares, Zoya has carved a niche for herself in the indie folk and world music realm. Zoya found her sound by fusing these influences in her latest EP, Letters to Toska, which was recorded and produced in her room. She decided to forgo using a professional recording studio to capture the raw and authentic sound she had always imagined. Born in India and raised in California, Zoya started her artistic and musical journey through Indian dance, in addition to hip-hop, ballet, and belly dancing. After dancing, she began painting, which sparked an interest in the visual arts. Eventually, though, she found her true passion in music. When she was around 12, she would spend her free time near a little river away from her neighborhood, where she would write lyrics and melodies. As an avid traveller, Zoya has a curiosity in the international music scene. After studying Music Business at Berklee, Zoya plans to go to London, where she hopes to shift from managing artists to international tour management and booking, all while fostering her eclectic sound and passion for music. 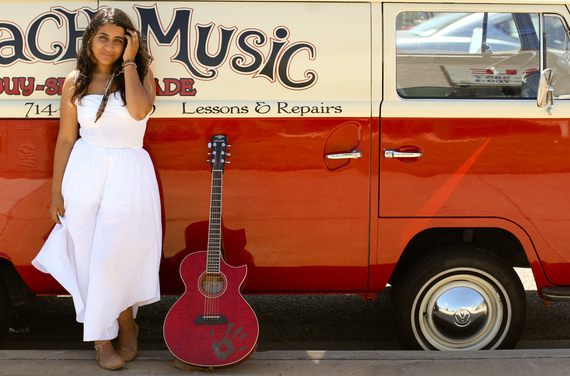 Before moving overseas, Zoya will be performing at Georges Island through Berklee's Summer in the City Series. Also, she will be releasing a new record, The Girl Who Used to Live in My Room. Her upcoming record will be filled with world percussion, and will be more minimal in electronic beats. By adding the sounds of the trumpet and vibes, Zoya will show the second chapter in her musical exploration. Since maintaining the raw and natural sound of her music is of utmost importance to her, Zoya recorded her latest single, "Hold On," live on film in March. With Paul Sefchovich on djembe and Joon Laukamp on mandolin, watch Zoya display her captivating vocal melodies along with her genuine sound below. Want more? Check out her Facebook, SoundCloud, and YouTube channel!